According to Agence France-Presse, the film includes "images deriding Auschwitz," "Dieudonne's violent and alcoholic character dressed as a Nazi officer for a fancy dress party," and "Holocaust denier Robert Faurisson [appearing] as himself." 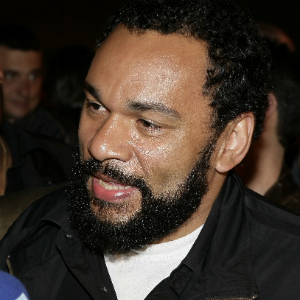 Produced by the Iranian Documentary and Experimental Film Center, The Anti-Semite stars Dieudonné, who has been charged numerous times for violating European laws with his controversial statements and performances, including one recent show in France that was halted mid-performance by authorities "for breaking local defamation laws." As for the Cannes screening, the Cannes Film Market's Jerome Paillard explained the move thusly: "Our general conditions ban the presence of all films threatening public order or religious convictions, as well as pornographic films or those inciting violence." It is tough to pick a side in this. While I find anti-semitism and Holocaust denials repugnant, laws against offensive speech are counter to a free society. The festival and market have the right to deny exposure to any film they so desire, for whatever reason they see fit, but being "charged numerous times for violating European laws with his controversial statements and performances, including one recent show in France that was halted mid-performance by authorities "for breaking local defamation laws."' is altogether frightening and reflective of the type of overreaching governmental control that free people should not tolerate. Plus, we don't know enough about the film. Is it truly anti-semitic? Or does it make fun of those who are? Or does it attempt to but the guy is more provocative than good at his job? His ex-comedy-partner, who was Jewish, calls him anti-semitic, so there's that. But still, for groups to want to censor and prevent this from being put out on DVD? How is that any better? "laws against offensive speech are counter to a free society"
... Not at all. Freedom does NOT mean you can say anything you want, do anything you want. Freedom has its limits, which is what makes it "freedom". Punishing racial insults or incitation to hatred makes a society MODERN and DECENT. These insults and hate speech are a form of violence, so just as physically attacking someone is reprehensible, this types of speech are. Dieudonné has made very clear in several serious interviews (even some on an Iranian TV channel) that to him Jewish = Sionist and Sionist = Evil, the source of evil in the world, the worst thing. I'm quoting him. His "humour" about the Shoah is not humour, but what he really thinks: that the Jews deserved it. I hear Mel Gibson and Lars Von Trier are going to sue the film's maker for plagiarizing their dreams. So the movie was "banned from screening"? This means that it was PICKED by Cannes Filmfestival authorities first! Why that? They pre-screen the movies, supposedly, before they pick them. Or not? That would explain why so many wonderful films never get screened at Cannes. But that one, that is "banned" WAS FREAKIN' PICKED? This is a reason to be pissed off. But not at the filmmaker, folks! And I am right now wondering what Sacha Baron Cohen did right to get "The Dictator" out there. I just saw it, it's great. And full of truths. By the way: Lars Von Trier did not make a Hitler-joke! People, please read up on what really happened, and stop spreading false gossip. Thanks. Correction: "one recent show in France that was halted mid-performance by authorities for breaking local defamation laws" - that was not in France, that was in Belgium (in Brussels, which is a mainly a city of French speakers). The authorities' claim is opposed by many witnesses, and courts are still to settle this.